Our best estimates, based on a projection of the most recent data through the current period, is that the current cumulative number of abortions from 1967 through June of this year is 59.4 million, of which an estimated 20,350,000 are Black American abortions. Considering that the total current Black American population is about 42,000,000, the 20,350,000 Black American abortions are equal to 48.45% of the total Black American population. If not for abortion, the total Black American population would be approximately 62,350,000, or 48% greater than it is today. This is based on an analysis of data from the U.S. Statistical Abstract for 2013 and the National Vital Statistics Report, Vol. 64, No. 1 dated January 15, 2015. This analysis was done recently by Dennis Howard, President of the Movement for a Better America who has written extensively on abortion demographics. In 2015, there were an estimated 9,168,000 Black American women in their childbearing years between age 15 and 44 which make up around 14% of all women in that age group in the United States of America. The number of Black American births is a dramatic change from the earlier trend between 2000 and 2009, when births grew from 623,000 in 2000 to 671,000 in 2009. That’s a growth rate of 0.83% a year. If that trend had continued, Black American births in 2015 would have reached 705,000 in 2015, or 83,400 more than were actually born. The Total Fertility Rate for Black American’s is 1.8, which is again below the replacement level fertility rate of 2.1 or the rate at which a generation can replace itself. Clearly, abortion is the biggest single negative force on Black American growth generally, including Black American economic and political power. Keeping the Black American community smaller and less powerful reflects the racist, eugenic and genocidal mindset behind the abortion policies advanced by Planned Parenthood and the Democratic party under the guise of helping Black Americans. 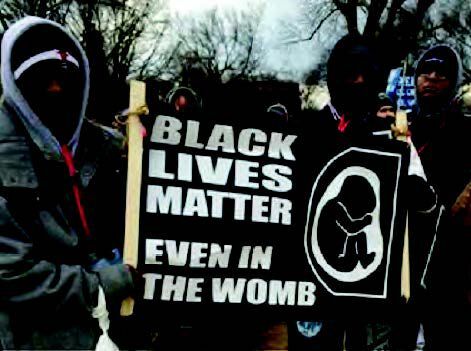 If “Black Lives Matter,” then the life of the human being inside the womb of his or her Black mother matters too.